We have a female black lab that is just 12 years old but has been showing signs of hip dysplasia for over two years. We have worked with our local vets to reduce her weight from 90 to 70 pounds in the last few months. She is taking both Rimadyl and Tramadol daily. She still wants to take her daily walk but is now starting to have a hard time getting her hind legs to help her up. My question is about total hip replacement. At her age do you think it would work and what type of recovery is involved for an older dog? What would an average cost be? I can’t say whether a total hip replacement is in your dog’s best interests because the decision is based on so many variables like your dog’s weight (congratulations on her weight loss – great job! ), condition of her other joints, concurrent health problems, desired activity level, etc. It is probably best if you discuss the specifics of your dog’s case with specialists(s) in both the medical and surgical care of advanced hip dysplasia. Non surgical treatment options that you may want to consider in addition to what you are using now include physical therapy, nutritional supplements (e.g., glucosamine), additional pain relievers (e.g., gabapentin or amantadine), acupuncture, cold laser therapy, and stem cell therapy. Generally, combination therapy that includes several of these therapies works better than any one of them alone. 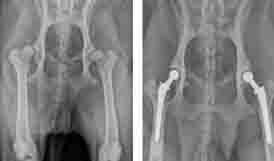 Two surgical options might be appropriate for your dog – a femoral head ostectomy (FHO) or a total hip replacement. In general, FHOs tend to work better for smaller dogs (under 50 pounds or so), but some larger dogs do well postoperatively also. It’s hard to estimate the cost of these surgeries because they vary based on the part of the country where you reside and many other factors, but a hip replacement would certainly be more expensive. The Ohio State University website is quoting $4,400 to $4,700. Join in and write your own page! It's easy to do. How? Simply click here to return to Hip Dysplasia.